This extended sampler of joining techniques takes the form of evening attire for the adventurous woman. A full length sheath of crystal organza wraps the body, bound around the torso to emphasize the female shape. An over-skirt is suspended from the shoulders and sits low on the hips. The flower-shaped half cape falls jauntily from one shoulder, while across the other is a decorative piece combining shoulder frill and flower ornament. Disparate elements in non-traditional materials are united by the limited colour palette of orange, black, silver and white. Texture and a variety of reflective properties provide interest and light. No one element is patterned, but recurring curves and flower-like shapes produce an overall pattern. Each piece of the ensemble asserts its own personality and presence, while combining together to form a coherent whole. When I try to write a little more formally it sounds like a parody. The requirement for this section of work was for a small series of join samples, developing previous work in some way. My initial notes: “Want to develop possibilities. A series of joins and joined which can be mixed around – components. A kind of continuing the play and exploration of the exercises. Work at just a little larger scale, and provide a link using colour – black, white and orange. This shifted a little when writing about Erin Manning (29-June-2015). I could make the components a bit bigger, and join them in a clothing-like composition. The initial sketch focused heavily on an underskirt of black insect mesh and side paniers of joined curved pieces of plastic. I had some exciting ideas for sleeve treatments. There was a large central gap on the page in the bodice area, which would be a more improvised combination and joining of multiple smaller elements. This sample began with foil shelf liner from sample p1-24 (22-June-2015), in which a pairing with hessian was unsatisfactory. I extended the foil with additional pieces, joined with strong silver adhesive cloth tape. The same tape was used to reinforce damaged areas in the light foil, and to create a firm edge for punching a series of holes. The foil was joined around the hips of the mannequin by lacing. The unshaped foil was not secure on the mannequin. I created suspenders, using chains of joined paperclips. 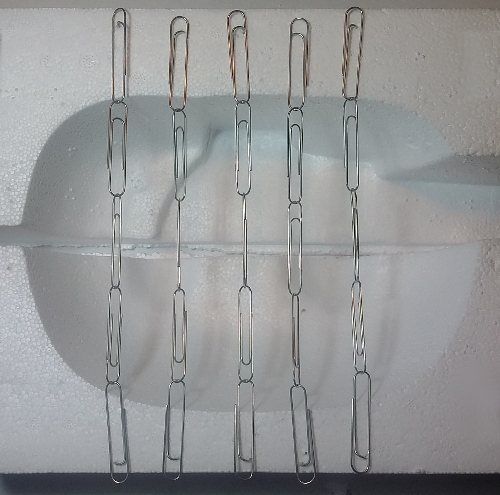 Each end paperclip looped into a bulldog clip, providing a way to join to the foil without creating a hole and thereby a point of weakness. This is a development of variations in sample p2-16 (18-June-2015), with the suspenders playing a more active part in the current join. The suspenders tended to fall off the shoulders, so an additional chain of paperclips was added across the back to join the two sides. After this photograph was taken the suspenders were lengthened and the foil cut down to make the top line sit better against the line of the hips without a gap. A skirt of insect screening was joined to the foil using the circles cut around the base. To make each join a piece of tightly crumpled orange tissue paper was held within a fold near the top of the screening. 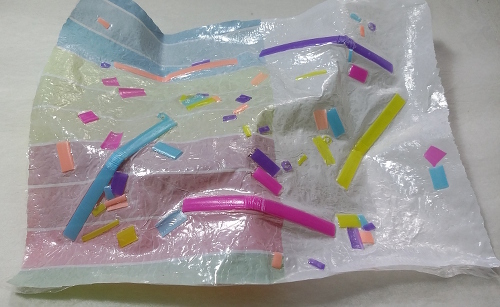 The tissue paper was pushed with the screening through the foil’s hole, then the tissue was flattened into a disk so it could not be pulled back through the hole. This was the same join plan as in the earlier sample, but this time it worked – although reinforcement/repair with tape was needed on some holes. The match of materials is particularly pleasing. Both foil and screening have a grid structure in a smooth, untextured material. The disks of the join repeat the circular shapes of the foil edging. The orange of the tissue links the overskirt to the rest of the ensemble. The overall shapes formed bear a resemblance to simplified geometric flower shapes, and similar referencing appeared in other areas as the work overall developed. This sample came closest to the “reusable module” initially conceived. 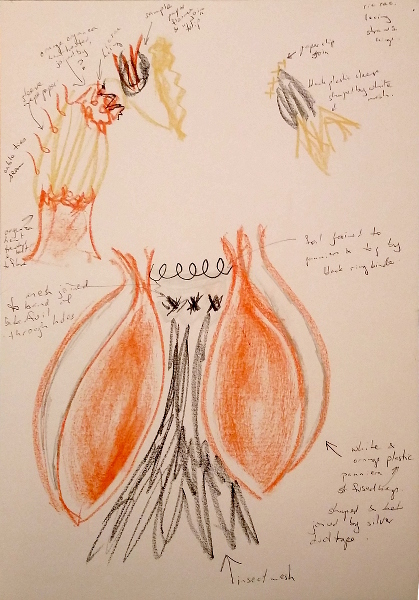 The original sketch had what I called pannier skirts – separate items extending out from each hip. I cut curved shapes of plastic, hoping the create the volume desired, and joined them with silver adhesive cloth tape (a join method I had considered but not undertaken in earlier exercises). Tied roughly in place the pannier fell limply. The volume intended was lost, and they would have covered much of the suspended insect mesh skirt. 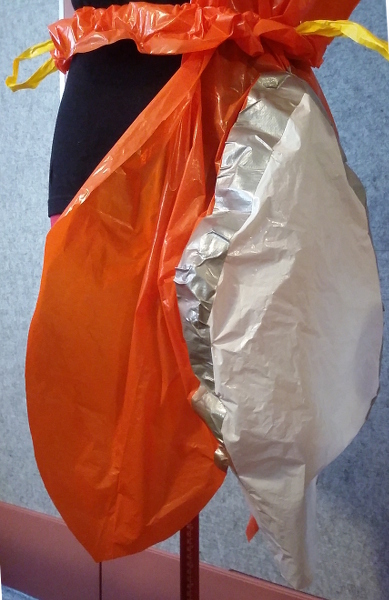 Further research revealed that pannier skirts use an underlying hoop structure to hold their shape. The joined shape suggested a cape, and I pursued that possibility. 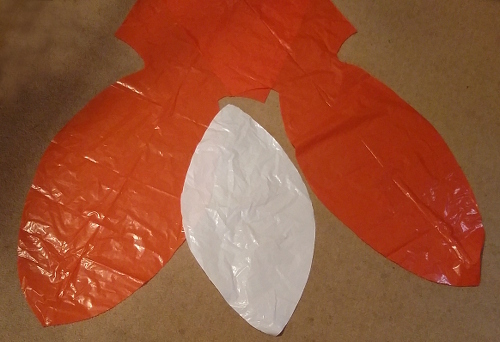 The extensions of orange plastic, originally conceived as a possible extension of skirt into the bodice area, were removed. The top was neatened and strengthened with the wire binder wire which was less than satisfactory in sample p2-28 (27-June-2015). 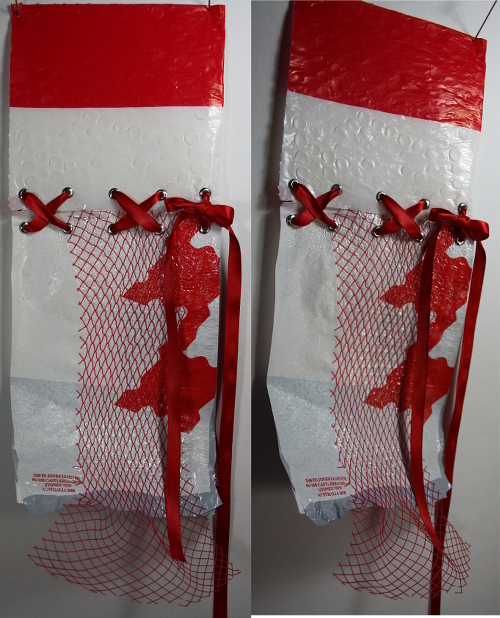 Finally the half-cape can be fastened around the neck by a loop made from a plastic mesh fruit bag. It forms a join by looping around the two ends of the binder wire, and although slightly fiddly it acts functionally as a clasp. The shoulder acts like the hoop of the pannier, allowing the viewer to appreciate the volume and petal-like finish of the cape. This sample would more properly fit within the wrapping category of the next project. It consists of a large square of white crystal organza, wrapped around the mannequin and held in place with a wrapping of orange stranded cotton. It was included in the Extended Sample set for functional and aesthetic reasons. 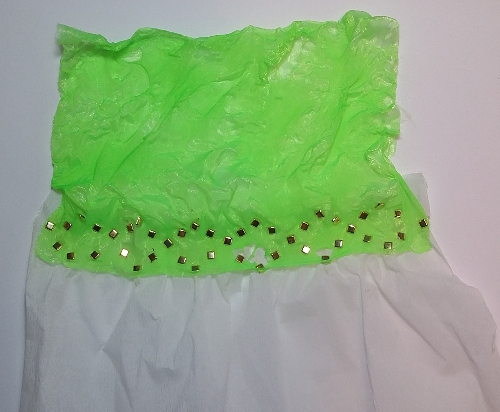 It acts as an underskirt for the foil and screening skirt. I had earlier planned multiple layers of screening, as I like the variation in depth created by layers of that material, but there was less left on the roll than expected. The crystal organza filled the bodice area in a time-efficient manner and is visually in keeping with the rest of the ensemble. It also allows for some of the shaping of the female form to be visible, in an outfit which was becoming rather blocky and concealing – although if ever actually worn a lot of leg would be shown! This ornamental wearable item was previously sample p2-18 (19-June-2015) and also includes the ruffle of sample p2-13 (18-June-2015). 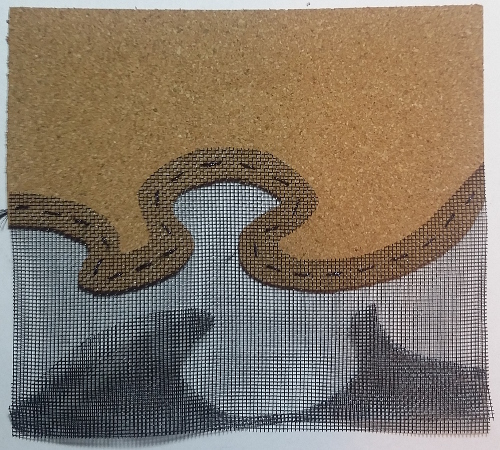 Here the paper base has been trimmed to echo the curves of other areas in the ensemble, and joined to the outfit with a simple pin (seen inset in the photograph). The shaped curve of the ruffle sits beautifully around the shoulder cap, and the “tulip” of screening and cable ties links with the ensemble in materials, colour and flower theme. I see it as analogous to a brooch. Overall I am very happy with the set of samples combined in this Extended Sample. Additional elements were planned, but not possible in the time available. More importantly, I think that additions would threaten the overall unity that has been achieved. For example the puff sleeve of orange organza and white crepe paper would have been an interesting extension of sample p2-23 (22-June-2015), with careful application of heat possibly producing flaring of organza in the lower sleeve – but I think at the cost of cohesion. The planned tiled patterning of either sleeve or bodice using piano hinge joins would have been overload. As is, the sample actually looks like something that could be further refined and actually worn. I am particularly pleased with the items where earlier samples were revisited and improved. The orange-black puffs at the join of foil liner and insect screening enhance the overall appearance of the work. The ring binder wire, so heavy and out of place in the earlier sample, falls smoothly into the shoulder and neck line, and its curves echo the curves seen elsewhere in the ensemble. The “brooch” adds texture and interest, completing the garment in the same way as a piece of jewellery would. At this point the course notes ask for Stage 3 – Recording Outcomes for the project. I have been recording work incrementally in this blog, so will move on to the next project. 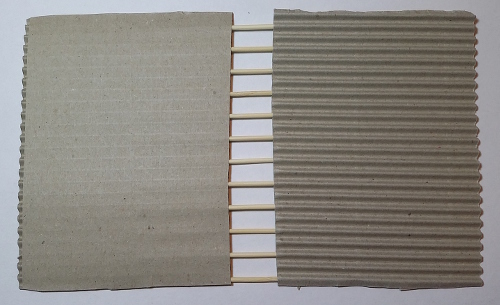 My first sample for corner joins uses a white, fine, corrugated cardboard pinned to a “corner post” of synthetic acoustic felt offcut. The result is a crisp, strong and stable 90° join. The shine from the domed heads of the pins provides a lift, avoids sterility, without disturbing the strict monochromatic lines of the cardboard. While the exterior is very clean, the interior shows that the short sequin pins I used were not short enough, protruding through the thickness of the felt. In a sample this is not a major issue, although I needed to take considerable care placing the pins. As is I could not submit it physically to tutor or assessors, and in a larger or more permanent work I would need to adjust materials in some way. A number of recent samples (p2-22 and p2-23 for example) seemed to suit a certain level of precision. This sample took me to extremes, well beyond my comfort zone and normal aesthetic. However I feel my efforts were repaid. It may not be obvious that the glue line of the cardboard carries across the join, but I think it would be quite obvious if it didn’t. 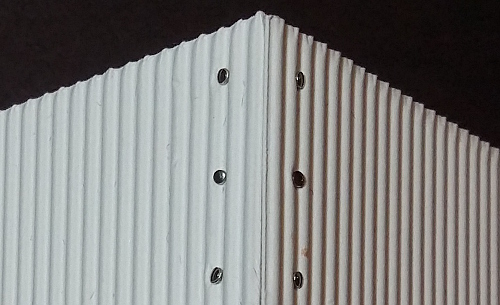 The pins are placed at 1 cm intervals, and one reason for selecting corrugated cardboard was the groove providing a vertical guideline. The eye is able to enjoy the clean lines of the sample without any visual jars. At this point I stopped to consider the next join I wanted to make. Fellow student Claire’s sample of fabric manipulation (shown right, with permission) joins pieces of fabric at a lower level, but what we see is actually a single created piece that has been cut in a squared spiral. Those wonderful striped straws highlight sections, not joins, of the piece – and provide a lot of movement and interest. Pippa Andrews (www.pippaandrews.com/) shows structural forms, some of which appear to use sewn channels and inserted rods, although with different outcomes. 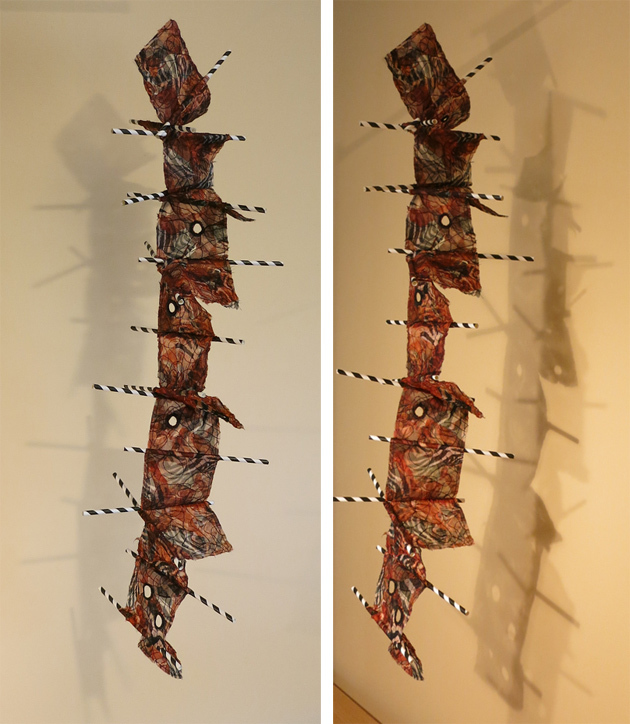 Spikes and spots: Red (2006), illustrated in the e-book 3D Mixed Media Textile Art, is exciting and dynamic. It uses a limited colour range of red, black and white, curves like an illustration of a dna strand, and uses spikey plastic straws creating movement and volume. Andrews also creates works of tubes or beads of rolled paper, joined using right angle weave and nylon fishing line. I haven’t sampled joins of this type in the current project, where the joined elements lose individuality and become a component of new, larger structure. The open-ended nature of all these joins is interesting. Another fabric channel, another straw, and the sequence is extended. 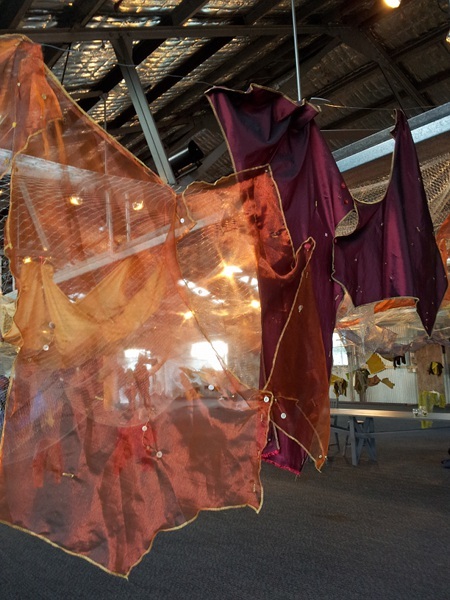 In the 18th Biennale Sydney all our relations Erin Manning filled a very large space with baskets of cloth dress pattern pieces, each with buttons, holes and magnets. New work – hangings or cloths – were created from pieces pulled together, joined as required with existing links or by adding more. I attempted a quick ink and pen sketch of Claire’s sample. I struggled to get the sense of movement and excitment I see. With that preamble sample p2-26 looks a bit tame. The materials used are woven and glued tissue paper, prepared when doing research on Aztecs last December (link), and a pencil. The papers were cut, folded and sticky tape used to form a piano-hinge join. Clearly this type of join is not fixed at a particular angle, providing flexibility. I used the left-over tabs from the original join to create another one. This is full of potential. I could go in any direction, cutting into an edge or creating a loop on the face of one of the pieces – two simple slits would be the most direct way. I want to return to some of these ideas in my end-of-project sample. Sample p2-37 returns to the idea of using the properties of the materials to create the join. The sample is basically a variation of p2-12 (14-June-2014). Bend the wires and you have a join around a corner. That sample has been dismantled and some of the parts reused, plus it was more interesting to repeat the idea in different materials. Bendy straws have appeared in p1-40 (11-April-2015) and elsewhere (but carefully not in p2-26!). 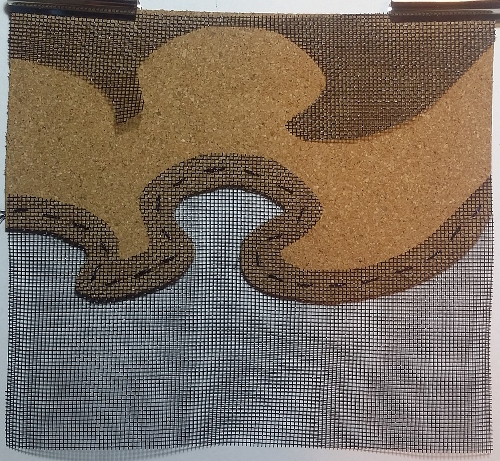 In the new sample I joined two pieces of plastic latchhook canvas by threading sections of straw through the holes. The bendy straws provide some flexibility to alter the angle of the join. No additional fixing was done other than the weaving through, so the join could be pulled apart fairly easily, but it’s not flimsy. There are any number of ways the join could be made more permanent and still flexible if that was required – a few spots of glue, or just folding the straws and weaving in a different direction would be a start. The same material was joined in sample p2-6 (11-June-2015) and I think that visually the two methods would work very well in a combination. Thinking about hinge joins, flexibility in angles and book openings led to the idea of using a wire binding spiral in a join. Above is sample p1-65 joined to p1-75 (both 21-April-2015). Slits were cut into the edges and used to connect them to a recycle desk diary binding. Getting the obvious negative over and done with, the binding detracts from the materials. It is large, heavy, visually complex and distracting. It is obvious utilitarian structure, naked and exposed. It’s what I had to hand, and I think good enough to capture the overall idea. Positives in the sample include a strong yet highly flexible (in terms of angle) join. It was easy to match pieces that had very irregular curved edges – simply cut a slot where the natural shape intersected with the binding. If desired this could be altered to manipulate the shape and draping of the joined materials. I very much like the foil and organza together. Particularly in the first photograph you can see pink reflections in the foil, and pink shadows on the desktop. In the second photograph the foil’s reflection acts as a backlight to the organza, a great way to get the advantage of the heat distortions without needed to worry about light sources and what else shows through. The course notes warn that efforts in joining curved edges on a corner could be unsuccessful at times. This sample came very close to one of those times. Balsa wood was cut in a curve. 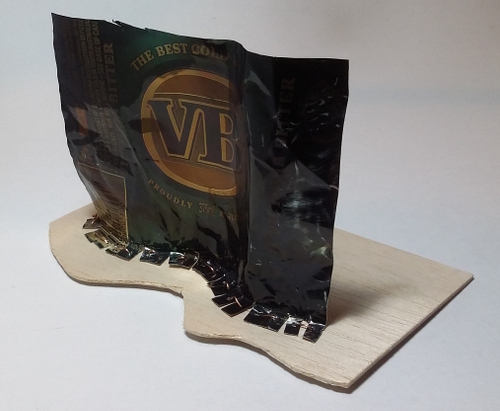 A rectangular piece of heat-coloured beer can was cut along one edge to provide flexibility. The idea was to fold the notches of metal over the edge of the wood and fix with a line of stitching, ending with a right angled join neatly following the edge line. I bent along the notches, positioned the first one and created a stitching hole with an awl. Result – a neat hole in the metal, a broken corner of the wood. Pushing through the hole simply split the wood. My second attempt used some craft foam in place of the wood. That wouldn’t split. However it did tear, and couldn’t survive the process of pulling through stiff and unruly wire to form the stitch. With some thought I identified two specific problems with the original idea – and some matching potential solutions. Pushing through a hole forced the wood on either side apart to create space. What if I punched a hole, removing the excess material and not creating sideways forces? Second problem – working right at the edge meant any split had catastrophic consequences. I could make the join away from the edge, reducing the impact of bad holes. The new approach was effective. The join isn’t the most elegant I’ve seen, but a little more care in cutting and bending the notches would help, as would less handling of the materials in processing (and re-processing). Although away from the curved edge that was part of the point of the exercise, the join follows that curve successfully. In a larger piece it might look good to do additional piercing along part or all of the edge to further highlight the shaping. I continued to find it difficult to stitch in wire – it kept developing kinks and cutting into the edges of the pierced holes. I think practice would help with this. The join and combination of materials looks good from a range of angles. It’s interesting to compare this result with p2-5, which joined the same materials using plastic from the 3D pen. That join also allowed me to create curves in the material (admittedly with a break). The bright green plastic used then is more of a statement than the copper wire in the current sample. The curves are aligned in the two materials rather than an angle being formed. Either or both methods could be useful, depending on the specific application. 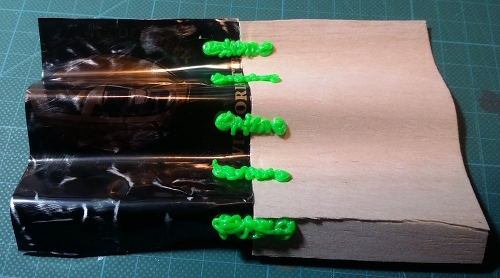 For my final sample in this group I decided to go back to a very early exercise in the module – crumpling paper. Almost all the corner joins sampled introduced an extra material to effect the join. Could I use a join material that would reflect the curved nature of edges being joined? I used paper as the material to be joined. It’s about the weight of printer paper, and with hindsight I wished I had chosen a heavier paper, or even a light cardboard. For no conscious reason I wanted green to look fresh with the white bank layout paper used for the crumpling, and didn’t think about other properties. I glued the papers together (Aleene’s super thick tacky), and it clearly wasn’t a neat, near-invisible join. However it was sufficient to allow me to play with forming rounded shapes in the crumpled paper. I think this is an attractive and effective join. There is a lot of flexibility in the join – it doesn’t need to be consistent at one particular angle. The soft green paper means the sample flops around a bit. Something a little firmer would create more form and perhaps some visual tension between stiff and flexible materials. Too much weight would overwhelm the crumpled paper. A wire mesh could be used instead. Looking at the effect this could be fun to use in beach shoreline theme. 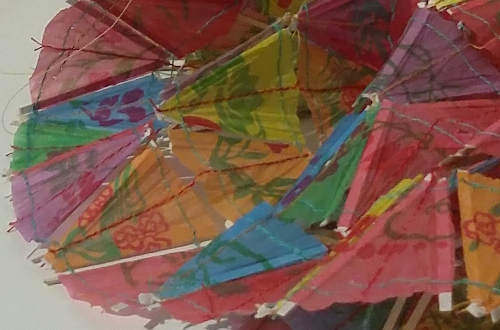 It would be interesting to see the effect of adding colours to the crumpled paper. There is such a difference in size (the crumpled paper started as A3, the joined pieces A6) that it really becomes two joins with three sections of material. 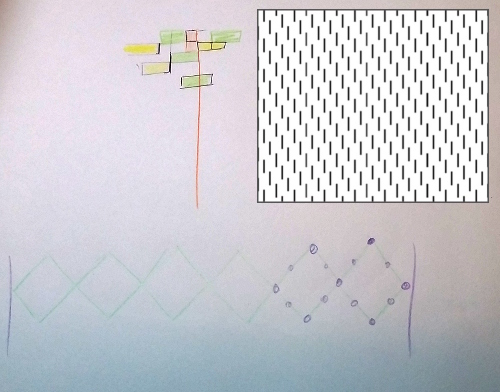 The course notes for this exercise suggest starting by placing “one edge over the other to create an overlap of about 1 cm”. I may be overthinking, but it seems that a lot of overlapping joins, either straight or curved, could look just like a flush join. For example sample p2-3 d (6-June-2015). That upper piece could actually sit behind the lower piece with a 1 cm overlap. For some applications it would be a good idea – no risk of gapeing or draughts. There is little bulkiness. The difference would be structural rather than visual. Useful but trivial in the absence of a particular purpose. So I’m looking for joins which take advantage of the overlap. One way is to see the lower material through the overlap. Here I have the offcut of cork from sample p2-15 (18-June-2015), overlapped by insect screening. Wanting a joining method that was visible but not intrusive, I auditioned a number of threads for stitching. In the finished sample the join method highlights the curves of the join without overwhelming the overall composition. The glitter of the chosen thread matches the screening well. The stitching becomes a subordinate feature. After completing the sample I experimented with different placements of the trimmed screening material. Some interesting positive and negative shapes are generated as the is moved and rotated. If I were to develop the sample in this way an invisible join of some type might work. Perhaps a glue could be used, although this could leave a gloss or film. The reverse of the sample suggests possibilities in using varying depths of materials. Seeing the lower material through the overlap worked well, but of course I don’t want to be restricted to see-through materials. Piercing the upper material at the overlap greatly broadens material choices. Wanting clean holes and given I only have circular punches, I selected a paper embossed with circles and some metal with traces of a mesh used when heating it. Punching holes through metal was tricky. There were a few mishaps, which led to the idea of using embossing as well as actual holes on the metal. The mechanical join was intended to be invisible so I chose to glue. I consulted with fellow student Claire, and used Aleene’s super thick tacky. The end result is very pleasing. The materials compliment each other in colour and motif. The transition from one material to the other brings additional complexity and interest, achieving an integrated whole. The actual join structure is effective, providing a strong bond without impinging on the visual result. The photograph was taken at an angle to reduce reflections and gives a reasonable impression, but seen in person there is a varying shine in the metal and the soft sheen of the paper which is particularly attractive. This sample stretches the idea of overlap to include partial integration of one material into another. 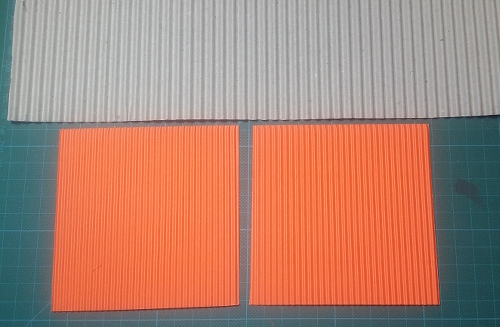 The materials used are a craft paper which is actually woven of something like rafia, lightly glued to a non-woven synthetic base, together with some orange foam. I spent a long time analysing the weave structure with pencil and on the computer, trying to figure exact measurements and placement to continue the design into the foam. Neatness and precision seemed paramount to create the effect envisaged. I really made hard work of it – there were false starts and at one point I felt close to total failure. Eventually I improved my handling techniques, and the inaccuracies are not too intrusive. The two sides of the join are well integrated, with the overlapping area providing a visual transition between very different materials. Colour choice was key in this sample, with the orange providing continuity across the join. On the reverse side the raw ends are entirely encased in a strong adhesive cloth tape. This is neat, stable, and effective in containing loose ends. Multiple independent joins are another method which highlights an overlap in a join. I was also interested in trying to take advantage of the properties of one material to influence the second material through the join. 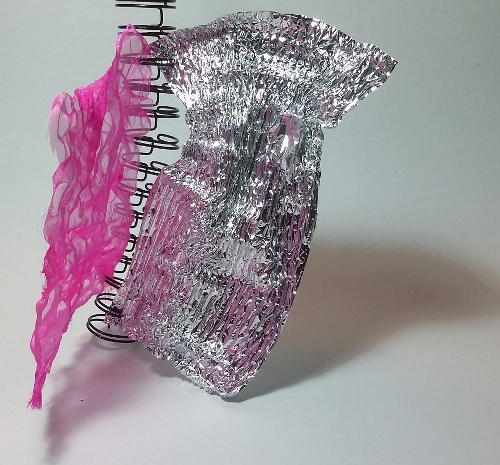 In sample p1-75 (21-April-2015) synthetic organza distorted and shrank under the heat-gun. What would be the impact if it was first joined to another material? I needed a pliable second material that would not put undue strain or restraint on the organza, and chose to experiment with crepe paper. 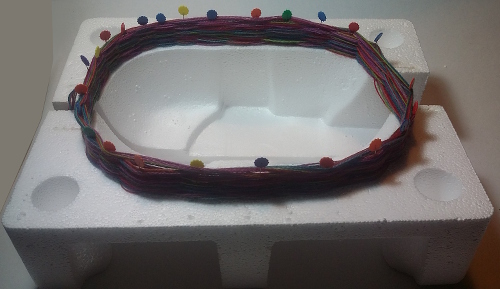 After heating the organza is around 18 cm wide by 12cm long. The paper was unchanged, but gathered at the join. There is a little tearing around some of the brads. Faster action on my part would avoid that if done again. There is some nice texture and variation of colour in the organza. The pattern of the set of the joining brads works quite well, the inaccuracies less apparent in the reduced size. The sample looks like a baby doll’s dress. Potentially it could be used directly like that in a work. It reminds me of Jin Nü’s work seen in the 18th Biennale of Sydney, Exuviate II: Where Have All the Children Gone? (http://www.whiterabbitcollection.org/artists/jin-nu-%E9%87%91-%E9%87%B9/), although she used actual dresses in that. For the final sample in this exercise I deliberately chose materials I thought wouldn’t work together. My earlier samples were all pleasant, some in my eyes beautiful, and I want to be a risk-taker. I also went larger again in scale. The materials chosen are a coarse hessian from a garden supply store (very rustic and natural) and a foil shelf liner (highly polished). When I got them out I was surprised to see an affinity in the grid of the two materials. The foil used was around 60cm wide. The join technique is in thought process an extension of the circles of sample p2-21, but actually pushing the lower material through to make the join. 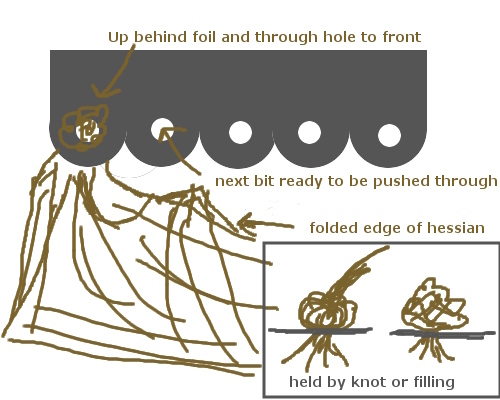 A small section of the hessian pushed through would be held in place by a knot (larger than the hole), or additional material caught inside the “puff” of hessian. It didn’t go according to plan. 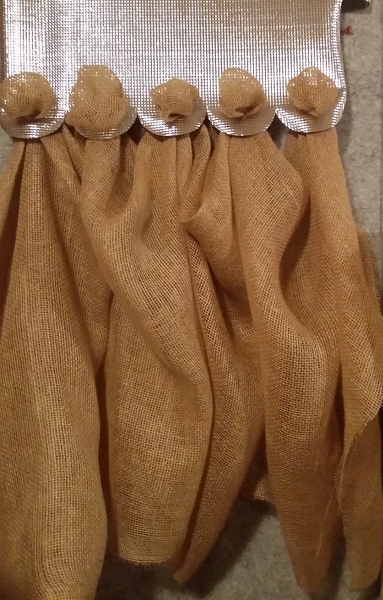 I couldn’t get enough hessian through the hole to form a knot. The foil liner began to tear around the holes and wouldn’t stand up to the manipulation needed to insert additional material. The foil was pinned to the display board and kept tearing with the weight of the hessian. The materials were too different to make the combination aesthetically appealing. Possibly roughly painting the hessian with a white or grey, or adding some trails of glitter or some foil applique would act as support to the existing small link of the grids. Both sides are too self-contained for the join to make sense. 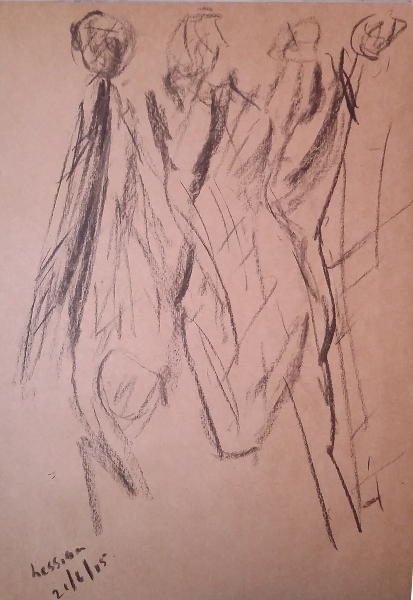 The sample did last long enough to be the subject of a sketch in charcoal on kraft paper to wind up the exercise. 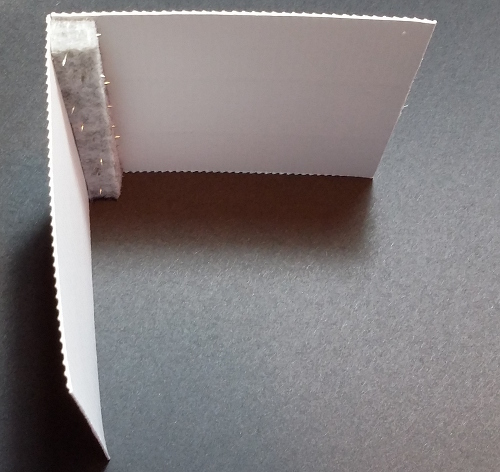 This sample aimed at joining curved edges that both touch and leave gaps. I cut two rectangular pieces of fibreglass insect screening, then cut one edge of each into curves. The first cuts didn’t give multiple touch points, so I did some trimming. A few touches and one overlap. Sample p2-17a. Where there was a touch, I made a join using orange cable ties. Sample p2-17b. Where there was a gap or an overlap, I forced a join with blue cable ties. It doesn’t look hugely different from a top view, but the tensions caused by closing gaps are beginning to distort the screening. Samples p2-17c (purple) and p2-7d (yellow) continued the joining process. The mesh of the insect screening looks crisp and clean and as it is distorted moiré patterns highlight the movements. The cable ties create dynamic lines across the field and bring focus to the critical area of the join. In this sample there was very little overlapping of screening. Multiple depths of shadow could be achieved by layering of the material – an area of potential for later exploration. Materials from earlier samples were used to explore joining to the edge of a hole. 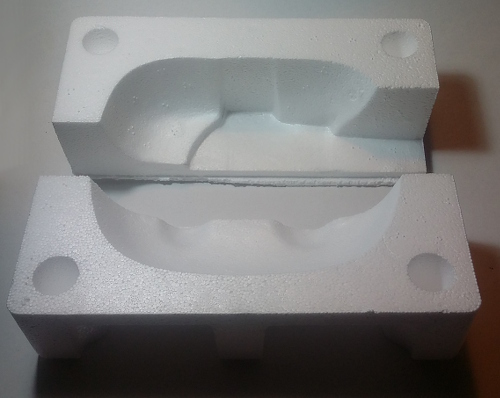 Sample p2-13 (18-June-2015) provided the base, and an offcut from sample p2-17 the joined material. The two materials were joined using cable ties, using holes punched into the base and pushing through the mesh of the insect screening. 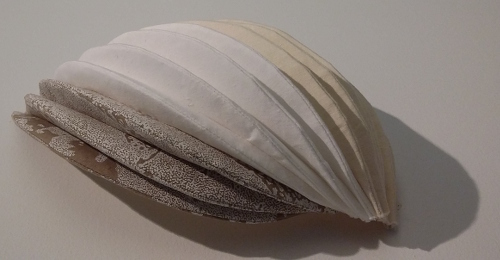 Curve joined to curve creates a tulip of mesh, cupped around a jumble of cable-tie stamen. Mesh undulates across the work, echoed and framed by the white curves of paper fanning behind. Light is layered passing through the materials, shadows can be soft, gridded or overlapping. In her report on assignment 1 my tutor suggested “continue developing your writing style and look for new ways to talk about your work”. The previous paragraph was an attempt at that. Not too bad, but what I really want to say is that I love, love, love this sample. There is a balance of materials, dynamic colours and forms, a sense of space and such variety of shadow. The final sample for this exercise is a hole filled with another material on the same plane. For this I used indigo dyed paper seen in the tearing exercises (26-April-2015), and indeed I was careful and thoughtful when tearing a hole, wanting to create a framing boundary of white. The filling material is cardboard cut from sample p2-12 (14-June-2015), and copper wire from the sample sample used to create the join. 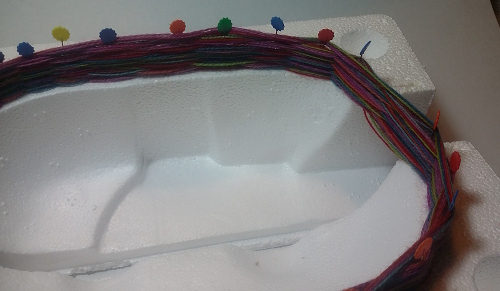 In this case the wire could again go through the channels in the cardboard, while simple stitches were taken in the paper. Crisp lines in cardboard and metal are contained by, integrated in, the organic patterning of the dyed paper. The complementary blue and orange, separated by a small space, enhance each other. All elements of the join – base, filler and join materials – work to create an harmonious whole. There are similarities in method, although not mood or meaning, to Edward Ruscha’s work Gospel, seen at the Art Gallery of New South Wales (AGNSW collection). Most of my samples are exploratory fragments developing ideas and techniques with future potential. I think this sample can stand on its own as is. This work session was fairly quick and uninterrupted, unlike some recent “sessions” which were pockets of time gathered over multiple days. I enjoyed the materials, processes and the results. Balancing this, in my final sketch I just could not see the sample in front of me, despite multiple restarts. When reading ahead and planning this project I thought of forms such as Jemima Parker’s, seen at the Tamworth triennial (22-May-2015). I also thought of the flounces and ruffles in the amazing The art of manipulating fabric by Colette Wolff. Now that I’ve worked through the earlier exercises, I see that curved edges don’t necessarily mean 3 dimensions. Nevertheless I decided to start with work based on Figure 4-12 in Wolff’s section on flounces. My version of that is on the right. An opened donut of material is cut for the flounce. The inside edge is applied to another edge. 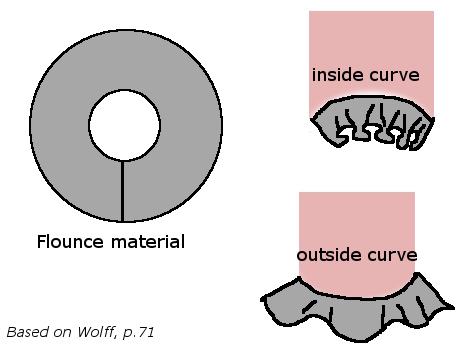 The fullness of the resulting flounce varies based on whether it is applied to a straight edge, an inside/concave curve or an outside/convex curve. I used bank drafting paper for the flounce and copy paper for the base material. Both flounces are the same size. The curve on the base is the same, but one is concave (p2-13, on the left below) and one convex (p2-14, on the right). Flounces are attached using many, many short lengths of sticky tape. There is no drape in the paper, and with sample p2-13 in particular it was very hard to persuade to sit in the same plane as the base material. I didn’t want to press in pleats, but some creasing was needed to stop the flounce flipping over the other way. Very nice volume, shadows and lines. For the next sample I wanted to keep flat, with curved edges that fit neatly together. 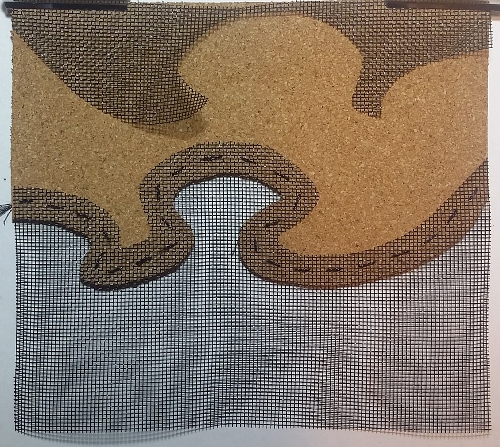 This sample used 2mm balsa wood and slightly thicker cork mat. A fairly complex line was traced from a french curve on the wood, which was then cut and sanded. The wood then acted as a template for the cork. The fit is fairly good. I chose challenging materials to cut and was quite pleased with the result. I used a waxed linen thread, bought for bookbinding, to stitch the wood and cork together. Stitch placement was based on a set of rules I devised. Working from one end, one stitch at a time, don’t look back, don’t look far forward. Measure forward 1 cm from the previous stitch along the join line. Lay a ruler across the join at that point, and pivot so the ruler markings line up with the next little section of join (that is, to form a continuous line). Measure out 1 cm each side and pierce to make stitching holes. Stitch. Repeat. 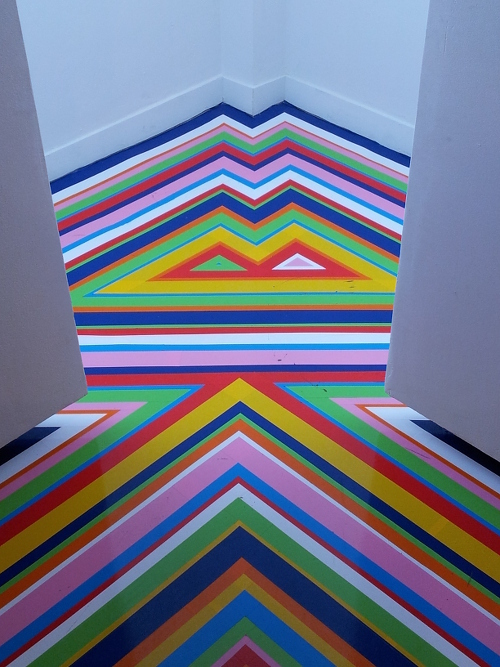 I was thinking of Jim Lambie (having seen Zobop at the MCA last year – 15-April-2014) – tape along the border of a room. Lay another line next to it. Repeat. It looks a mess. The curve is lost in a jumble of lines pointing every which way. The back is cluttered in a different way. Those painstaking measurements make no sense. It looks jabbed at random. As an experiment, I drew the line in ballpoint pen on a piece of paper, and marked lines with a chalk-pastel pencil. The lines make sense. Nothing was measured, except by eye. I can still see the flow of the curve. Just a few simplifying choices in the tight curves, a wider view taken both ahead and behind, and the effect is very, very different. 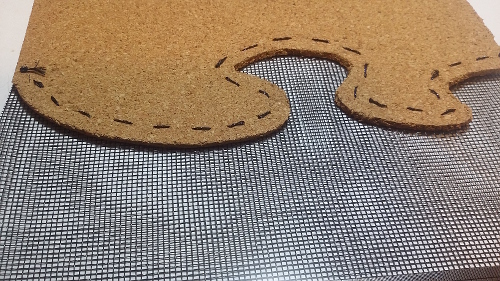 The drawn line is smoother than my cuts, and of course there are no gaps at all, which simplifies and clarifies. I like the wood and cork because it is a record of a thing that happened. It has the imperfections of life, the mis-steps of not knowing what’s ahead. I like the textures of wood and cork and thread together. There is more to discover as I look at it longer. 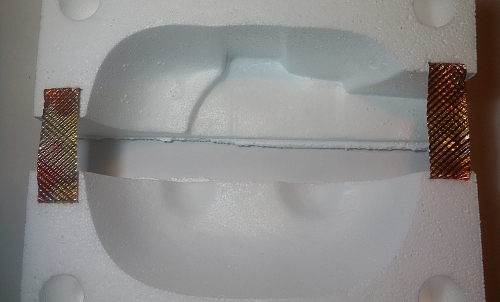 For curved edges with a gap, I picked up some styrofoam packaging. Highly three dimensional, but my focus is the top surface and those curving edges (which cradled our new rice cooker in a previous life). The first join of simple cocktail sticks in the sides will stabilise the large pieces while I work. Although very simple, this takes advantage of the particular material being used. The two sticks were simply pressed into the styrofoam. Just those two connections were sufficient for a quite stable join in the light material. In sample p2-16b two strips of heated (for colour) and embossed (for texture) metal were bent at the ends – like “[“. Each end was pressed into the stryofoam. The play of light on the two materials works well. The decorative metal straps enrich the image, but the rather delicate line of the curved top is still visible, enhanced by the shadows of the void below. The large area of the white stryofoam is actually quite complex, and balances well with the stronger colour but smaller area of the metal. Enjoying the technique of pressing materials into the foam to form a connection, I tried with library tags. The tags were difficult to connect firmly – the styrofoam surface was beginning to show damage. To me it just appears busy and messy. The tags need to create more of a visual statement, or else fade more into the general view. The tag I put on the top to show the materials used now appears as a saving grace, helping the viewer to interpret the image. In sample p2-16d the join is no longer confined to the ends of the curves. 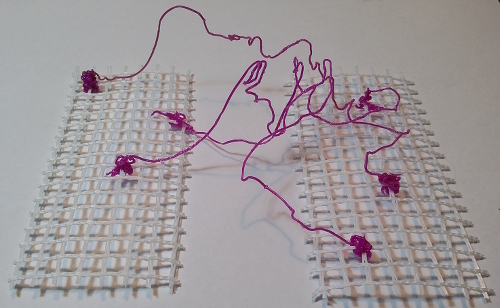 Map pins and coloured plastic string create a pattern on the surface. The curved lines of foam and the cocktail stick “structual” join virtually disappear. The strong pattern takes over. I expected to like a chain of giant paperclips. There is a combination of curves and straight lines which might have complimented the lines and curves of the foam. However the result is anaemic. A series of paperclip chains in sample p2-f creates more of an impact, and there are some signs of interesting shadows below which perhaps could be developed using various lighting angles. The curved lines which are the intended focus of the exercise have almost been lost, although now the echoing of shape (lines and curves) is more apparent. If you hide the clutter around the sides – the damaged areas, cocktail sticks, those strong circular holes in the corners – it starts working. However for my final version I wanted to emphasise the curved line of the edge. A series of flower-headed pins, with a bundle of multi-coloured wool yarn woven through, forces attention to the curved shape. Extending the height of the edges above the surface also reinforces the depth of the space below. I found myself suddenly aware of the entire object, not just the surface and interior. The colour and visual density of the wool puts the styrofoam material into the background. Its space and volume are enhanced, but the actual fabric, the textured surface with all its variations and complexity, is put into the background. On the other hand, in my eyes the join – or more accurately the gap between – is more apparent. The woolen fence is a bridge, crossing a space with two distinct sides. Focusing entirely on the sample, I felt I saw it with fresh eyes. The drawing is more a reminder of that seeing rather than an interesting thing in itself, but at least it has the advantage of lively lines. The next set of samples is based on items joined by stitch over a gap. shoe/forest.html Stitches fragments together using a soluble material while working. Dijanne Cevaal (http://origidij.blogspot.com.au/2005/01/ribbon-lace_09.html) This work might fit more correctly in overlapping joins. I believe Dijanne sews over a soluble material, but there is also a layer of tulle that the motifs are stitched to. One frequent theme is the use of materials that were recycled or would otherwise have been discarded. I love the fragmentary effect, and a level of randomness in some of the interactions. Liza Green’s Tissue of Lies is very effective in the inclusion of scraps of text from newspapers. Some works use a fairly regular grid of stitching, others are more informal. For my warm-up sketch I focused on some photographs of Lorna Murray’s work, seen in the recent GROUP exchange exhibition (22-May-2015). Lorna spoke at the related symposium. My brief notes include: The ordinary, the mundane; The space in-between; Rubbish collected – assembled as cloth, structural, transforming the discarded into precious; Dyed plywood (natural with synthetic); Traditional techniques, unconventional materials; Process as important as the end product. And my own thought: Cocktail umbrellas, transformed into something sculptural, architectural, beautiful. In the sketch I wanted to focus on how the sections fit together, and where the stitch lines fell. This is conte crayons and felt tip pen. My first sample in this set is very simple. I wanted to get a basic idea on the sewing machine’s behaviour, if I needed to worry too much about needle or thread types, the actual process of stitching across the gap (I didn’t want to use a soluble layer, working on paper). I used different types and weights of paper – newspaper and a glossy calendar photo. I used a bland polyester thread and the anonymous needle already in the machine. It worked OK. The length of thread across the gap is variable. If I was really worried and still didn’t want to use soluble or scrap in the gap I could count stitches as I went. I like that the threads of the stitch twist over themselves – an alternative would be to pull a length of thread out manually so they remain separate. I could use different colours of thread which would show in the gap. I left long, loose threads at the ends, but of course they could be cut short. They could also be used to stitch manually somewhere, or knotted, create tassels… Stitch length was 2.2 mm and the papers seem quite strong and stable. Slightly more adventurous, this sample uses baking paper with imprints from natural dyeing with gum leaves (4-April-2015) and some kraft paper originally coloured for bookbinding a journal (25-July-2014). Thread is rayon machine embroidery thread in needle and bobbin. Stitching goes across at an angle. Originally I intended to do more lines and cross them in the gap, but at this point I felt any more would detract from the leaf print. Having written that comment I went back and added a crossing line. Unfortunately the variegated thread was light at this stage and I think it shouts a bit, but it suggests possibilities with creating additional pattern in the gap. The reverse view is attractive, removing the visual complexity of the watercolours. You can see I changed bobbin colour during the work, which adds another element. This naturally led my thoughts to trying real gum leaves. It worked mostly. Something happened to break the thread on the last intended row. The leaves haven’t broken, which surprises me. I tried to keep basically straight rows, thinking to contrast with the organic shapes of the leaves. I like the back view, especially the cracks in the leaves. There was no particular method in the leaves chosen or the layout – they were what I could find on the grass in the dark, and in the order I picked them up at the machine. I find the lines and the positive and negative shapes created very effective. This was the sample I first thought of a while back while planning for the exercise. I rejected the original idea of monofilament – it looked too fine to make the visual impact I wanted. This uses indigo dyed papers last seen around sample p1-87 (26-April-2015). After the first couple of rows there is some excess thread. I have some painters tape keeping the ends together, hoping for a fairly flat end result – although some three dimensional shaping could be interesting another time. A little later some of the loose thread is a little stabilised, and I have a thread across the end to aim for. I stopped rather than finish the sample. A lot of the lines of stitch are straight rather than the flowing look I wanted, and the more open part on the bottom just isn’t working. I think I need to use some kind of support to stitch fluidly along the gap. Perhaps some kind of tearaway product. There are aspects I like. It reminds me of river systems seen from the air, especially coming into the dry season when water is disappearing and signs of the flow are left on the banks. The small lines of needle holes are good, especially when backlit. I didn’t do the puncturing exercise in Assignment 1, but stitching without a thread would have been interesting to explore. I wonder if different sizes of needle would create a noticeably different hole. In exercise 1 (6-June-2015) I showed a join with a gap in corrugated cardboard. This time I’m working with a finer, more refined version of corrugated cardboard. It also has the advantage of a great colour – unfortunately one my tablet’s camera has trouble processing. P2-12a is a simple, even join using lengths of 22 gauge wire. I had other colours of wire, but mostly in 26 gauge which didn’t fit the spaces firmly and was a little flimsy generally. It’s very balanced, regular, stable. The shine of the copper wire is a good match to the matte, shadowed surface of the cardboard. A change in spacing creates some more interest while still being very stable. Potentially this could be used as a framing device. Sample c shows one of the advantages I was hoping to obtain by using wire. It is very easy to vary the width of the gap. The earlier cocktail sticks would snap or tear the cardboard if I tried this. A close spacing looks less stable – and it is. There is some flex in the wires that were bent in the previous version, and the cardboard isn’t sitting flat. A displacement of the cardboard pieces introduces a dynamic element, although the whole retains a formal, geometric feel. A more fluid variation is shown in version f. At this stage I could have ventured into bending in three dimensions, but I think there will be an opportunity for that in a later exercise. Instead there was an association with version d that I want to explore further. Three strands of 20/2 silk have been needle-woven through the copper wires. I am very excited by the possibilities here. Simple changes in spacing create quite different effects. My general preference is to display the sparkle of the copper within the sheen of the silk, but any choice would depend on the particular application. A support like this could also be used to create lettering, or possibly simple imagery. “Warp” manipulation is also possible. Lots of weaverly techniques are now in play. Space can be incorporated by bending wires or connecting to a larger cardboard structure with multiple elements. Other decorative elements can be added to the wires. These are oddments from past play or workshops, lurking in my wire drawer until the right opportunity comes along. Given this cardboard is available in multiple colours, foil finishes, could be painted or drawn upon, all the different weights and colours of wire I could use… the permutations and possible applications are enormous. I was hoping to return to lacing and experiment with joins with a gap. There could be all sort of associations with lingerie and strip-tease. I also wanted to try chain links. For now there’s only time to note the potential and move on to the next exercise.